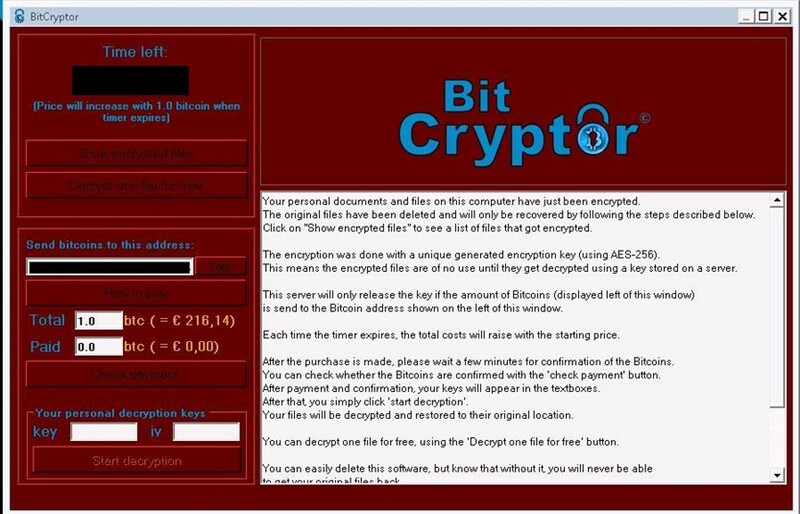 Bitcryptor Virus is a virus of the ransomware variety. These are viruses that infect your computer and try to trick you into paying money in order to get rid of the virus. It will encrypt the files on your computer and keep you from using important programs on your computer. If you are unable to open certain files and are getting strange warnings when opening them then there is a possibility you have been infected with BitCryptor or a similar type of virus. Also, if your wallpaper has been changed then it is another good clue. Getting rid of the program can be difficult too because it blocks you from using certain utilities on your computer. In order to release your files, you can pay a Bitcoin to unlock all these files. The funny thing is that many of them will honor the transaction and release the files. If you feel you have to go this route you should never use your credit card or personal bank account to make the transaction. Go buy a prepaid money card in order to do it. But, our goal is to keep you from having to do that in the first place. With a good backup and the steps below, you will be able to be back in business in no time at all. Most of the infections will occur from opening a spoofed email on the system. Furthermore, it will mostly happen on machines that are not protected by some sort of virus protection program. If you have a virus scanner, and keep your Windows up to date, then you should be safe from this treat. Removing BitCryptor manually is next to impossible. You can use a tool like SpyHunter to help you remove the virus from your computer. In order to download the software, you will need to reboot your PC in Safe Mode With Networking. This will load Windows with the minimal resources necessary and prevent the virus from acting out on the OS. Below are the steps to restart the computer and download the tool. Step 2. You will be presented with a list of boot options. Choose Safe Mode With Networking using the arrow keys and hit Enter. Step 3. Download the tool using the Orange button above. Step 4. Install the software and run an thorough scan of the system. Run the scan until you get a clean bill of health. Once you are convinced the PC is clean then restore your files from your backup. You may also be able to right click on files and select to restore previous versions if that feature is enabled on your PC. It is a good idea to restart Windows in normal mode and run the tool again to see if it catches anything else.